An awesone tiny Monkey for summer salmon. These are every bit as deadly as our legendary Baby Temple Dogs. Tied on 0.5" plastic body.ese are every bit as deadly as our legendary Baby Temple Dogs. Tied on 0.5" plastic body. 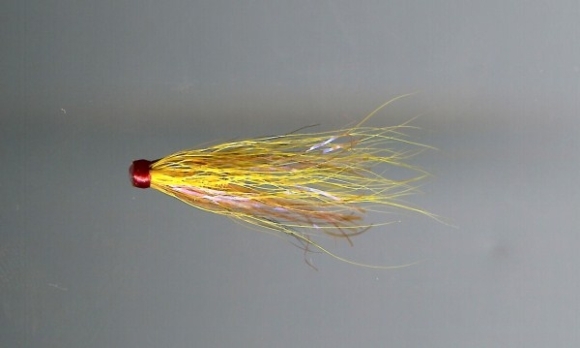 An absolutely deadly Monkey pattern with a red hot tag and JC to attract salmon on any river! Fish these fast and square across the river on the surface and watch salmon explode all over the fly! A simple but lethal Sunray pattern from Fulling Mill. This is a hitch version and only loads from the side. A superactive surface tube which can annoy salmon into taking when the going gets tough. These tapered 9ft copolymer leaders from Rio give you excellent turnover and abrasion resistance. We have them available in 5 sizes - 8, 10, 12, 16 & 20lbs. Perfect for salmon & steelhead fly-fishing. A great choice for low water in the summer and when using the deadly riffled hitch.